Cedar Point probably. My first multi-day visit there so I actually felt like I didn't have to rush the park. This is really tough for me. Kings Island, because I think their lineup runs deeper. Knott's - first visit was this year, and I fell hard for the charm this place has. Doesn't feel like a corporate park to me. They're fine, but I don't go out of my way for them. Besides, it's impossible to eat them without looking like a savage. 5. What ride exceeded your expectations the most in 2018? Arashi was an awesome 4D coaster it surprised me a lot! 6. Best meal/food at a park in 2018? Not sure what it was called but something from one of the Japan parks! 7. What was your favorite new coaster of 2018 NOT made by RMC or Larson? The only 2018 new coasters I rode this year were RMC's. 14. You're in Orlando and magically have a 1-hour ERT session on 1 coaster of your choice at any park in the city. You choose... Mako, I really want to ride it bad! 15. Holiday In The Park vs. Winterfest. Who reigns supreme? Holiday in the park was fun didn't do any Winterfest parks. 19. Battle of Kings Coasters: Island or Dominion? Pick one. Dominion has the better 1 2 punch and shorter lines so KD. 22. Best drop tower under 150 feet? Does tower of terror count? 25. What are 3 things you enjoying doing at your home park other than riding rides? Thats all I really do at my home park is ride the rides! Yes I was hit in the chest with a key chain of keys on Goliath's stall. I actually caught them as well and gave them back to the guy, he wasn't very grateful should have dropped them! 36. Skywarps: credits or no? State your case. Not theres no lift hill I know RCDB says they are but I don't think so that said I haven't rode one yet. 1 park a month was my goal for 2018. Such a tough call. Knoebels for Glowphest! Twisted Cyclone. I think it really elevated SFOG's collection. I only rode the new RMC's haha. Dual Dragons, that crazy inverted + sit down Intamin combo coaster in China. Mummy! Let's make Brandon Frasier jokes for an hour. Mystery shed. Good job getting this going KI, I'd love to see what surprises other parks could come up with. I waited about an hour for Cars. I had to wait almost an hour for Ghostrider, too. It was insanely busy on the Friday before Presidents day. Diamondback, thanks to operating the ride in 2009. Having a drink, leaving for Timmy OToole's, and finding shade. It's Six Flags. This is a tough question because I've only been to Knott's and KD once a piece, yet I've been to Carowinds, KI, CP so many times UGH. Right now I'll say Knott's is my second fav. It had this intangible charm, the boysenberry drinks/food were fantastic, the flume is top notch, and they have great rides. Half of which were closed when I was there and I still fell in love with the place! People seem to be having positive visits lately and there's a diverse coaster collection that's not offensive. I get more hyped for a launch. I love the anticipation. Hell yeah man be passionate about it. I understand it, and why not have a huge love for one of the best entertainment experiences in the world? All the B&M inverts are great. If it's a good park: a full stomach. Voyage is a fantastic coaster.. If this is a question probably no. JordyC wrote: 15. Holiday In The Park vs. Winterfest. Who reigns supreme? I FINALLY got to visit SFGAm on Mother's Day. It was amazing! I've only been to HITP at SFGAm, and I was quite impressed. I can't wait till the next one! Six Flags Great America. Clearly. lol It's been a theme for my answers. I know people like to knock SFGAm, but I think we have a pretty good collection of coasters and flats, plus we have Goliath. It may be shortish, but packs a punch. I love the stall. 40. Post a great on-ride shot of you from 2018. (DO IT! I'm cheating, here's one from 2017. I'm in the green, riding with my daughter! I guess Valravn. Didn't understand the hate. The View at the top is worth the ride alone. Dole Whip. Had it for the first time at HW and loved it. The Nagashima Spa Land RMC. Probably won't ever get to ride it, but in terms of seeing POV's and reaction to the ride, that's the one I'm most excited for. Haven't been on either, but #whatsintheshed all day. Never been to Kings Dominion so by default, Kings Island. Enjoying Free Drinks, Eating Dipping Dots, and Judging other people who say stupid things..
Holiday World. Wildebeest and Mammoth. Both days I was at Cedar Point. Didn't regret it one bit. Nope. If we don't count Larson Loops, then why should we count Skywarps? I don't eat at amusement/theme parks. Kings Island. Nothing beats the night rides you get on the coasters. Waiting in line for the rides. Walking around my park. Going to the water park. Kings Island because again of the night rides you get on their coasters. We got a solid coaster(and flat ride for that matter)lineup and a good water park. Yes at Kings Island. It was defiantly the right decision. Hell no and I don't care what RCDB says. I don't buy on ride photos. Well, I went to Knoebels, so…that or Cedar Point. Hmm…I ended up enjoying Invadr after my first couple rounds; Verbolten was more fun than I remembered; I finally developed an affection for some of the classic Arrows. I really liked that one loaded mac ‘n’ cheese place that everyone always talks about. The new restrictions, while frustrating to read about, didn’t hamper my choices at all. All of them were RMC except Adrenaline Peak. Zoooooom at Oaks Amusement Park. My mind seems to have settled on Six Flags Discovery Kingdom…I trust that won’t ruffle too many feathers. I’ve only attended Holiday in the Park. Dominion, though another visit to the Island could sway me…I think of it fondly and frequently, plus it’s got Beast. Oh, this is based off the coasters? Then definitely KD. Twisted Timbers is there. I don’t even know, so I’ll go with the one I anticipated and worried about the longest before finally riding it: Steel Vengeance. I really like a good S&S tower, but for ARM towers, the one at Knoebels stands out. At Enchanted Forest, that’s too easy and yet almost too hard. I’ll go with the walk-throughs, the fountain show, and the slides. Unofficially, it’s Kings Dominion. It’s one of the bigger ones and I like the setting and ride collection. Kings Island is very close in my mind. Enchanted Forest; the creepy, quirky old walk-throughs and the attention to detail throughout the park. I used several via TPR. I don’t care what anyone else says; it’s still Grizzly at CGA. Joker at SFDK, with the Messrs. Freeze a strong second. A wristband…I don’t collect them or wear them for extended amounts of time anymore, but they sometimes at least come home with me. A number of times, but nothing more than the likes of a branch, a lost hat I couldn’t catch, etc. Except for one time when I was riding a traveling coaster with my hands up (there were zero warnings not to) and I hit the track above me! No. Reason: they’re just not. I think it was Rougarou. Which is not a good ride, by the way. Funnel cake with strawberries on top. 1. Name 3 of your favorite roller coasters, but not your top 3. 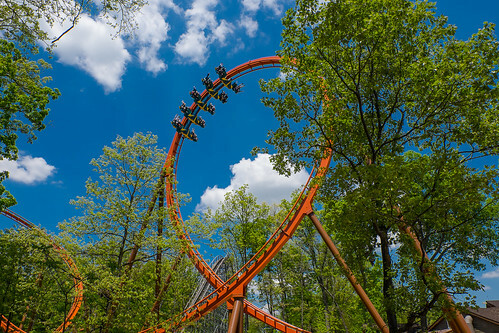 Mindbender at Galaxyland (#5), Kumba at Busch Gardens Tampa (#7), Phoenix at Knoebels (#9). 2. About how many different parks did you visit in 2018? Here, I’ll list all of them! Holiday World, Six Flags Over Texas and Over Georgia, Universal Studios Orlando and Islands of Adventure, Hersheypark, and Family Kingdom. 3. Which 2018 park visit was your favorite? Overall, Holiday World. It’s my #2 favorite park now, just behind Knoebels. I loved my Holiwood Nights experience (who wouldn’t), and my visit to Family Kingdom where I was able to rack up six laps on one of my new favorite woodies of all time— Swamp Fox. Also the radio there plays exclusively ‘70s hits, which to an old soul like me is a welcome addition. 4. Your favorite 2018 park addition (ride, food, show, etc)? I feel like Steel Vengeance was really well done, since Cedar Fair went all out with the theming and expanded the story of Frontiertown while adding a world class coaster. 5. What ride exceeded your expectations the most in 2018? Probably The Legend. It ended up as one of my favorite wooden coasters ever, but I expected it to be a rough and mediocre coaster— what I got on the first two laps— but after sitting in the front on my third ride I fully appreciated it’s ballistic laterals and one standing airtime moment. 6. Best meal/food at a park in 2018? Holiday World’s buffet offerings on the first night of Holiwood Nights. 7. What was your favorite new coaster of 2018 NOT made by RMC or Larson? Probably Hyperion, or perhaps Time Traveler. Never got to ride either of those though. 8. Name one park you will definitely visit in 2019. Carowinds because it’s my home park AND they’re getting a shiny new coaster. 9. Best ride themed to a bird? I put Thunderbird... but then I realized Phoenix is my #9, ahead of Thunderbird, so that wins. My 100th coaster credit and oh man did it deliver! 10. Lamest ride/coaster you rode in 2018? The Howler, but I had a cute experience on it where some random little boy wanted to ride with me so I accepted. 11. What roller coaster currently sits at the top of your bucketlist? (degree of difficulty: NOT a new-for-2019 ride) Steel Vengeance or DC Rivals. 12. What new-for-2019 ride or coaster are you most looking forward to? Steel Curtain, because it has the lap bars. It looks straight out of a fantasy NoLimits 2 coaster on YouTube. It has NINE inversions. Also it feels like something that should’ve been built fifteen years ago, when the coaster wars were in full swing, because of how daunting it is compared to the other 2019 additions. 13. Name the first totally middle-of-the-road (not bad/not great) park that comes to mind. Dorney Park. I visited this park in August 2017. Talon is very good by B&M invert standards, and I prefer it to Afterburn, Great Bear, Raptor (don’t get me started) and the Batmen I’ve ridden. Talon’s underrated, but Dorney Park as a whole is not. Hydra was a disappointment, and Steel Force met my mediocre expectations. Possessed was forgettable and the only credit I skipped out on was Stinger, which (unbeknownst to me) would get removed in a few months’ time. I’m not one to complain about operations, so the average dispatch speeds didn’t bother me at all. Thunderhawk was not as jarringly rough as I expected. Wildwater Kingdom is a pretty good waterpark, but I only was able to do the 2 wave pools and lazy rivers because of how insanely long the slides’ lines were. Overall Dorney is a nice, average-sized park, but not worth stopping out of your way for unless you’re in Philadelphia (which I wasn’t and never have been). Wow, that was a lot of rambling. 14. You're in Orlando and magically have a 1-hour ERT session on 1 coaster of your choice at any park in the city. You choose... Rip Ride Rockit. Hulk may be the better ride overall, but in the front row Rip Ride Rockit offers a more varied experience with strong G’s and a few pops of ejector airtime. Also I can jam out to some of my favorite ‘70s music on board, so win!! 15. Holiday In The Park vs. Winterfest. Who reigns supreme? I’ve only been to Holiday in the Park at Over Georgia once (went in December 2018), and while all of the good rides were open the decorations felt a bit sparse. From what I’ve seen of Winterfest online, hardly any large rides are open BUT the quality of the decor looks very pleasing to the eyes. So I don’t know this one. 16. Mystic Timbers mystery shed or Wicker Man fire infusion? Wicker Man’s because it just looks soooo cool! Mystic Timbers’ shed was very disappointing, in my opinion. 17. Which Six Flags have you been to most recently? Six Flags Over Georgia on December 29, 2018. 18. Intamin or Schwarzkopf? You may only choose one. Ugh! I love both. I have a fetish with Schwarzkopf’s (don’t get me started on praising Mindbender in Canada), but if we are going for how good the rides are in enthusiasts’ eyes Intamin would be the real winner here. 19. Battle of Kings Coasters: Island or Dominion? Pick one. Island, even though Intimidator 305 is my favorite steel coaster I felt that in my 2017 visit the quality of the coasters there decreased dramatically after I305. Flight of Fear would have to be my second favorite in the park, followed by Dominator and then Volcano I guess? Kings Island on the other hand has a spectacular top 4 of Beast, Diamondback, Mystic Timbers and Banshee, supported by Racer, Flight of Fear and Bat— Bat being a pleasant surprise from my two laps at night. 20. What was the longest you waited for a ride/coaster in 2018? Probably Wildebeest at Holiday World. I waited for 30 minutes, was next in line to board, but the ride shut down for another half hour as guests were evacuated from it. Then the ride started back up and everyone cheered. 21. What roller coaster have you ridden more than any other? Fury 325 at Carowinds, somewhere around 21 times. 22. Best drop tower under 150 feet? I don’t really go out of my way to do drop towers. In that case, Slingshot at Family Kingdom I guess? 23. Maverick or Millennium Force? (If you haven't been to CP, pick what you want to ride more) Maverick, my #2 steel coaster, but Millennium Force is in my top 15. 24. Log flumes or sky rides? You can only choose one. Sky rides, because I love them so much! More parks needed to keep theirs instead of remove them, in my opinion. 1) Taking friends to Carowinds for their first time(s) and seeing their reactions to stuff like Fury. 2) Chilling in the rocking chairs at the front entrance plaza, being surrounded by Fury’s massive structure. 3) Listening to the GP while in line to hear what kinds of absurd things they say about coast— Oops, sorry, went too far there. 26. What is your second favorite Cedar Fair park and why? Very controversially Cedar Point. Don’t get me wrong, it’s not even close to being a bad park in any way, but I was disappointed by most of the coasters there. I wasn’t a huge fan of the atmosphere either, and that there wasn’t that much to do in the park besides the rides. I prefer Kings Island slightly because of its wooded setting, more satisfying atmosphere and better coaster line-up. Unlike most enthusiasts, I don’t just count the good coasters in a park’s roller coaster collection— I count the bad ones too. 27. What is your home park and give us two good reasons why we should pay it a visit. Carowinds, 1) Fury 325 exists and 2) They’re getting Copperhead Strike, I guess? 28. Launch or Lift? Lift, because there are not that many launch coasters out there compared to the ones with a lift. But I do enjoy Storm Runner’s and Maverick’s launches a lot. Technically, I went with my cousin to Universal for her Make A Wish trip, and we got this awesome lanyard that basically was free fastpass. 30. What is your least favorite wooden coaster? “Great” American Scream Machine. So rough, so jerky and so painful, it absolutely bulldozed my decent expectations. I sometimes check in on the Disney fanboys’ news from time to time. I would dread to admit it, but being the Florida-born boy I am, I have nostalgia for Walt Disney World (just don’t mention that the Backlot Tour and actually Great Movie Ride were torn down, okay? Those were my favorite rides in the resort as a kid). Plus, I know several Disney fanboys online and I’m cool with them. Six Flags Over Georgia’s. I’ve ridden Over Texas’s too, but that one was not as intense. A new t-shirt or park brochures— I love collecting park brochures. THE VOYAGE AT HOLIDAY WORLD!! My #1 favorite coaster of all time. 35. Have you ever been hit with something (loose change/a tree/vomit/etc) while riding something? Well, while riding Mystery Mine, my dad’s prescription glasses came off and hit him in the face all during the half-loop maneuver. We didn’t realize what had happened until he no longer felt his glasses on his face. 36. Skywarps: credits or no? State your case. No, because it is only coasting on gravity for like five feet. It’s powered nearly all the way. 37. Turkey legs: nah or yaaaaassssss? Honestly, I really don’t care for these, so that’d be a nah. Superman Ultimate Flight at Six Flags Over Georgia. A fun flying coaster that offers a true gliding sensation. Back in 2015, I had a bad experience of being stuck in flying position for ten minutes on the brakes— it was NOT comfortable at all. On a more positive note; I love how Superman, even though it is a clone, was nestled into the hillside unlike the other two American copies. 39. You can eat nothing but corn dogs, churros or funnel cake for the next 48 hours, which do you choose? Corn dogs are a welcome meal for me. Family Kingdom’s funnel cake or the churros at my local Spanish restaurant wouldn’t be bad either. 40. Post a great on-ride shot of you from 2018. (DO IT!) Sorry, no thanks.